Nicola Sturgeon has confirmed she will ask for permission to hold a second referendum on Scottish independence. Ms Sturgeon said she wanted a vote to be held between the autumn of 2018 and the spring of the following year. That would coincide with the expected conclusion of the UK's Brexit negotiations. The Scottish first minister said the move was needed to protect Scottish interests in the wake of the UK voting to leave the EU. She will ask the Scottish Parliament next Tuesday to request a Section 30 order from Westminster. The order would be needed to allow a fresh legally-binding referendum on independence to be held. 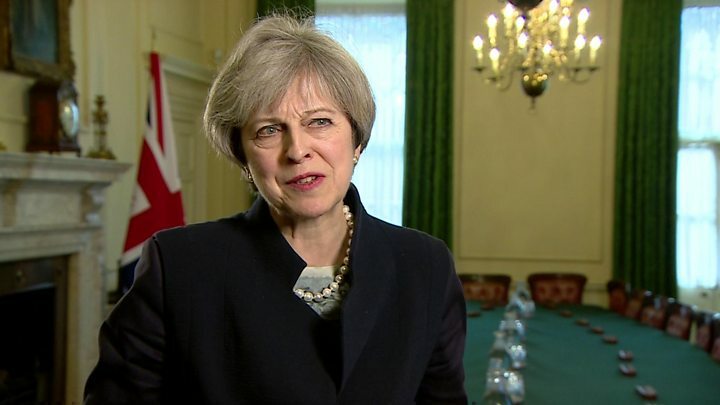 Prime Minister Theresa May has so far avoided saying whether or not she would grant permission. Responding to Ms Sturgeon's announcement, Mrs May said a second independence referendum would set Scotland on course for "uncertainty and division" and insisted that the majority of people in Scotland did not want another vote on the issue. She added: "The tunnel vision that SNP has shown today is deeply regrettable. 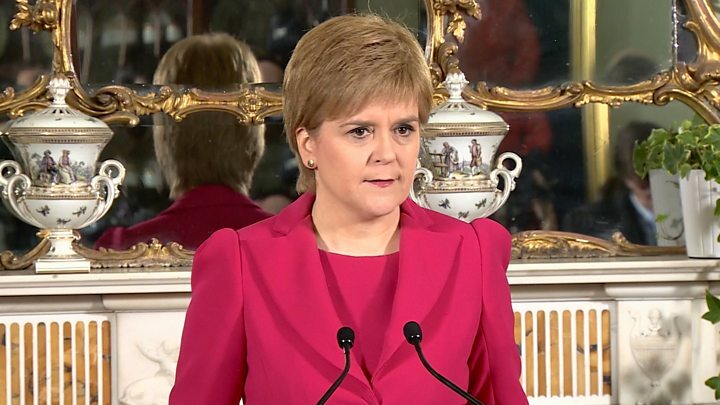 But speaking at her official Bute House residence in Edinburgh, Ms Sturgeon said the people of Scotland must be offered a choice between a "hard Brexit" and becoming an independent country. The Scottish government has published proposals which it says would allow Scotland to remain a member of the European single market even if the rest of the UK leaves, which Mrs May has said it will. Several questions now arise? Does Nicola Sturgeon have a mandate for today's decision? She says yes, unquestionably. In defence of this, she says that the SNP won the last Holyrood election with a record share of the constituency vote. Against that, rivals say the SNP did not retain their overall majority at Holyrood. Countering that again, it might be noted that there is a majority at Holyrood for independence, including the Greens. As will be demonstrated next week when those two parties vote together to urge a Section 30 transfer from Westminster. Which brings us to Question Two. Section 30 refers to the portion of the 1998 Scotland Act, the Holyrood founding statute, which permits the transfer of other powers from the reserved section to the devolved criterion. It has been used, for example, to transfer control over issues like rail transport to Holyrood. It was used, most significantly, to transfer power to hold the 2014 referendum, with agreement over the wording of questions and the timing of the plebiscite. Will the UK government agree to a transfer this time around? Not without detailed examination and negotiation. The first minister said the UK government had not "moved even an inch in pursuit of compromise and agreement" since the Brexit referendum, which saw Scotland vote by 62% to 38% in favour of Remain while the UK as a whole voted to leave by 52% to 48%. On Monday evening, the House of Lords passed the Brexit bill, paving the way for the government to trigger Article 50 so the UK can leave the EU. Will the PM allow indyref2? Ms Sturgeon said Scotland stood at a "hugely important crossroads", and insisted she would continue to attempt to reach a compromise with the UK government. But she added: "I will take the steps necessary now to make sure that Scotland will have a choice at the end of this process. "A choice of whether to follow the UK to a hard Brexit, or to become an independent country able to secure a real partnership of equals with the rest of the UK and our own relationship with Europe." Ms Sturgeon continued: "The Scottish government's mandate for offering this choice is beyond doubt. "So next week I will seek the approval of the Scottish Parliament to open discussions with the UK government on the details of a Section 30 order - the procedure that will enable the Scottish Parliament to legislate for an independence referendum." Ms Sturgeon said it was "important that Scotland is able to exercise the right to choose our own future at a time when the options are clearer than they are now, but before it is too late to decide on our own path." She said that the detailed arrangements for a referendum - including its timing - should be for the Scottish Parliament to decide. But she said it was important to be "frank about the challenges we face and clear about the opportunities independence will give us to secure our relationship with Europe, build a stronger and more sustainable economy and create a fairer society." The UK and Holyrood governments are set for a battle royale over timing over a potential vote. But the question first is whether or not the prime minster is willing to grant a vote. Under the law, Westminster has to grant the referendum; it's not just down to the Scottish government. I'm told Number 10 had carefully worked out "countermoves" depending on what the first minister's message was this week. Now Sturgeon has made the first big move, it's down to the other side to respond. But arguably we have just entered into the most complicated, most fraught, most fundamental period of political uncertainty for our country in a very long time. Sturgeon's announcement confirms that it is not just our place in the EU that is changing, but the relationships between our own nations that are at question too. Ms Sturgeon will rely on the pro-independence Scottish Greens to give her plans majority support in the Scottish Parliament. Patrick Harvie, the party's co-convener, welcomed the announcement and confirmed the Greens would vote in favour of seeking a Section 30 order. He added: "The people of Scotland deserve a choice between Hard Brexit Britain and putting our own future in our own hands". But Scottish Conservative leader Ruth Davidson said Ms Sturgeon had been "utterly irresponsible" and had "given up acting as first minister for all of Scotland". She added people "do not want to go back to the division" of a referendum and that Ms Sturgeon had promised 2014 would be a "once in a generation" poll. Scottish Labour leader Kezia Dugdale said Scotland was "already divided enough" and "we do not want to be divided again, but that is exactly what another independence referendum would do." But the party's UK leader, Jeremy Corbyn, confirmed that his MPs would not attempt to block a request for a Section 30 order. Mr Corbyn said: "Labour believes it would be wrong to hold another (referendum) so soon and Scottish Labour will oppose it in the Scottish Parliament. "If, however, the Scottish Parliament votes for one, Labour will not block that democratic decision at Westminster. "If there is another referendum, Labour will oppose independence because it is not in the interests of any part of the country to break up the UK." Scottish Liberal Democrat leader Willie Rennie said Ms Sturgeon's SNP had been "working towards this announcement for months" and were "determined to contrive a way to ignore their promise that 2014 was 'once in a generation'." He added that there was "no wide public support for a new and divisive referendum".